Since we have started receiving our weekly delivery from Johnson’s Backyard Organic, our vegetable consumption has increased dramatically. I’ve heard it can be stressful to figure out how to prepare them all or having them piled up in your fridge. For me, knowing what has gone into providing this box makes me value it more and want to eat those foods rather than reaching for something less than ideal. ! Some of the veggies can be intimidating, some I’ve never seen or heard of. Then there’s fennel, whose taste to me makes me so angry I can’t stand the sight of it. Thanks, Whitney, for taking it off my hands! I digress…most odd veggies can be utilized in a shake (that’s you, daikon radish) or completely transformed by roasting (cheers…rutabaga, kohlrabi, cabbage and turnips). Then there is just the plethora of the goodies that there doesn’t seem to be enough hours in the day for. Who comes to the rescue, but a scramble. They are delicious, easy and get everyone to try a wide variety of new veggies and flavors! And, these are budget friendly! Basic formula…pick the 3-4 veggies you need to get rid of and dice them up. 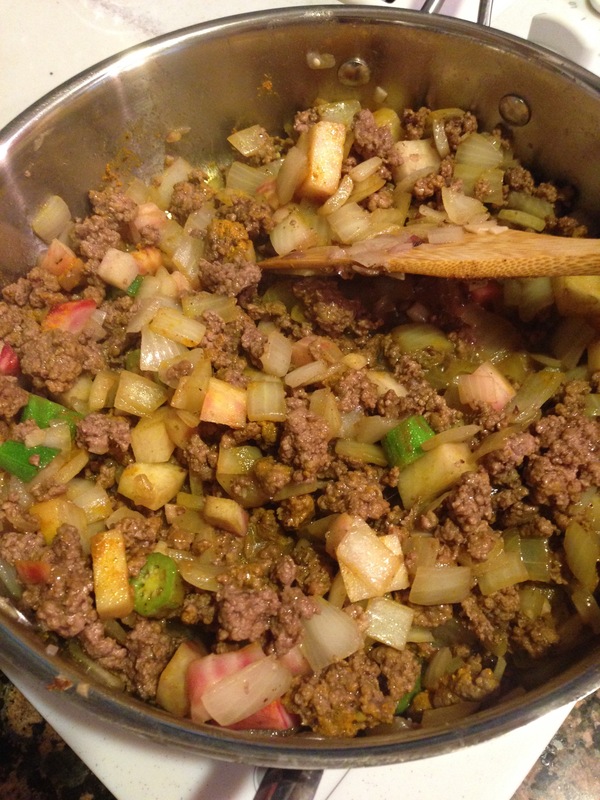 Add an onion and chopped garlic and some sort of ground meat. Sauté until thoroughly cooked. 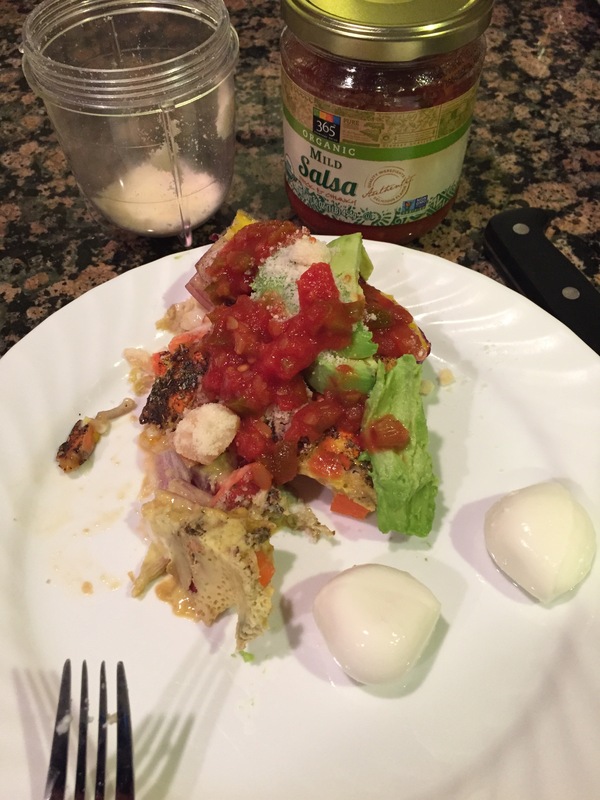 Toss on some cracked eggs and voila! 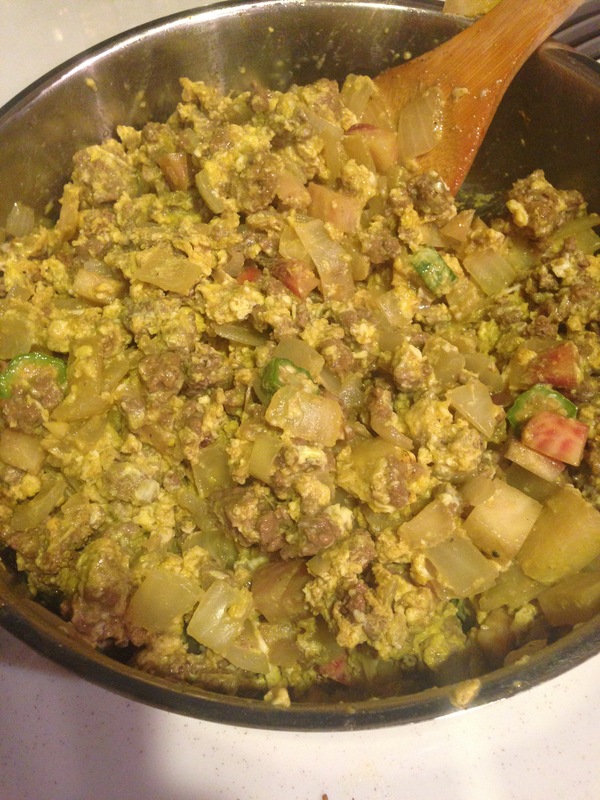 Tuesday’s scramble involved bulk chorizo from Whole Foods (1 pound), onion, rutabaga, yellow bell pepper and red potatoes. Sauté, add salt, pepper and turmeric. 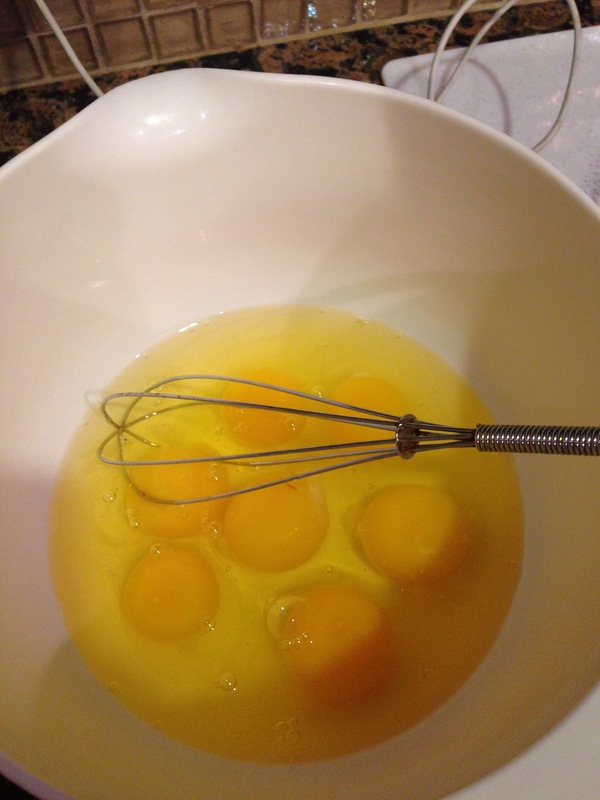 Then crack 4-5 eggs in a bowl to beat, or have your hubby ready to stir and crack them directly into pan with meat. Delish! 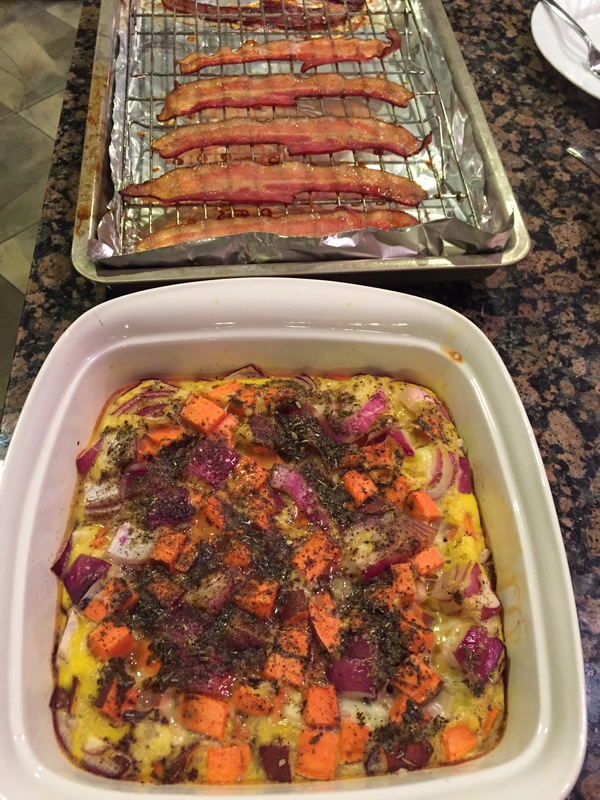 Tonight was egg Scramble…9 eggs cracked and beaten in a dish, throw in half of a diced red onion, a chopped sweet potato, garlic, salt, pepper and sage. Mix and toss in a 350 degree oven for 30 mins. 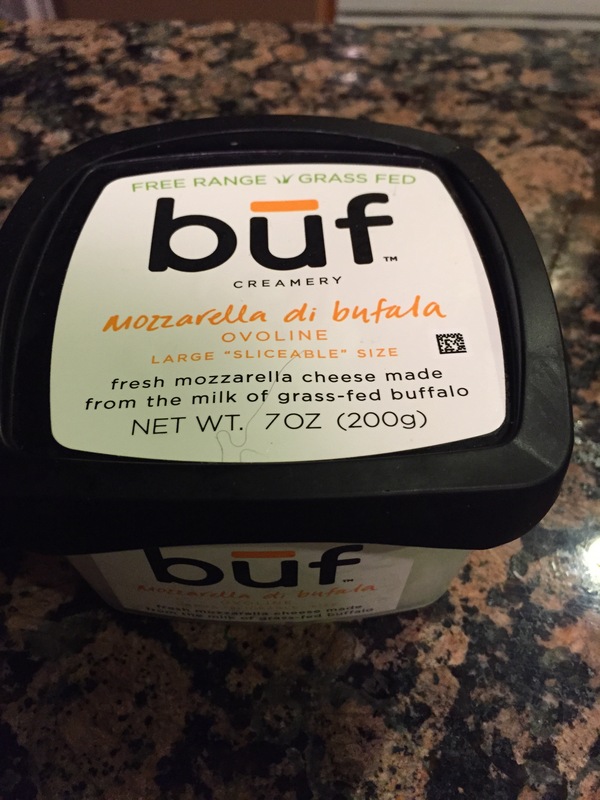 I then topped with grass-fed buffalo mozzarella, grated parm from my new Magic Bullet, an avocado and salsa. Wow! I also served this with a side of bacon, because what goes better with anything, but bacon! To top it off, we each had mugs of mushroom sherry beef broth to keep our immune systems up during flu season. What a perfect comforting and nourishing meal!